The aligners are comfortable, clear and removable which means you can still eat whatever you want, and it is easy to keep your teeth and braces clean. When you want to eat or clean your teeth – just take the Invisalign brace out – so your mouth stays fresh and clean with none of the hygiene problems you can get with traditional ‘permanent’ braces. You can also view your own virtual treatment plan, so you can see in advance what your new smile will look like. After an initial examination, we will talk with you about your orthodontic needs and your expectations, and will advise the treatment that is best suited to you and your lifestyle. We will take a digital scan of your teeth, and send these to a laboratory. Your series of Invisalign clear aligners are then created uniquely just for you. And, because the aligners are clear, they’re practically invisible, so you don’t need to feel self-conscious while wearing them. Usually you will wear each one for a week, before moving onto the next one. 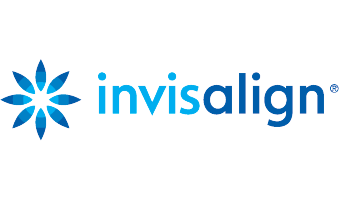 The number of Invisalign aligners varies according to each patient’s needs, but is usually between 24 to 36 aligners for both upper and lower teeth, taking about 6 to 9 months for treatment to be completed. We have an iTero Element scanner which allows us to take digital scans of your teeth instead of the old-fashioned impressions. These are more accurate and and speed up the time to start treatment. Overall you get a quicker and better end result.